The year 2015 is coming to an end. A year full of new developments and opportunities. A year full of too many conflicts all over our region. But also a year with new hopes for a more peaceful and cooperative future for all. The end of 2015 is again a time for reflection about the last year and a time to look forward to 2016. AWARENET has today more than 400 members from the Arab region and beyond. Nearly 100 institutional members; reflecting the strong interest and commitment of international, governmental, non-governmental and private sector institutions in capacity development for sustainable water management in the Arab region. 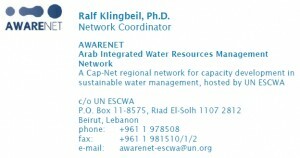 The membership level has continuously increased further over the last years, with now double the number of members compared to the beginning of 2014, when I was asked to take over the network coordination within my function as UN ESCWA Regional Advisor on Water. I would like to thank all AWARENET members for their continued membership, sharing of information, contributions and gratefully appreciated feedback on the various communications we had this year. Special thanks of course go to all also those of you who have been even more active in one of the three Working Groups: Climate Change, Water Footprint Assessments and Water Governance, and those who contributed or participated in any of the 2015 AWARENET training courses, Cap-Net UNDP global and other regional activities and exchanges. Of course all AWARENET communications and activities depend on the great support from our members and partners. A special thanks goes to our partners in the 2015 activities (in alphabetical order): ACWUA, AGU, Cap-Net UNDP, EU, GWP-Med, Integrity Action, IUCN-ROWA, MENA NWC, SIWI, UNDP Water Governance Facility, UfM, UN ESCWA, USAID, WSTA plus many other institutions at regional and national levels and the individuals who have contributed financially -directly or in kind- and volunteered their time for our common goal: Capacity development for sustainable water management in the Arab region. Of course we could always do more and better. Unfortunately funds and time are limited, but we are looking into ways to increase the funding base for AWARENET in the future. You as members are always also welcome to share with us any suggestions and proposals for joint activities in this regard. The last year has seen a number of new developments also with AWARENET: We have been able to implement two regional training courses on Water Integrity for the MENA Region and one regional training course on Water Footprint Assessments for GCC and Arab Countries. Beside of the renewed Working Group on Water Governance we have seen the starting / re-starting of two other Working Groups on Climate Change and Water Footprint Assessments. We hope that each of the WGs under their current Chairs / Deputy Chairs will be able to achieve their self developed goals over the next months until we go into the next election phases. AWARENET has just released its new website http://awarenet.info that currently already lists a number of past activities. This website will also present upcoming activities and shall in the near future also comprise some "members-only" benefits such as individual member profiles, downloadable resource materials, and forums for discussions among members. We will send soon some further information on the member login and use of these functions. The website also contains the draft AWARENET 2016 work plan as submitted to Cap-Net UNDP. Most of the proposed activities are still only tentative and can only be realized with the right combination of partners and co-funding. Those of you who are interested to support some of the activities either as financial partner or through in kind support such as e.g. hosting a training course are most welcome to get in contact with me. 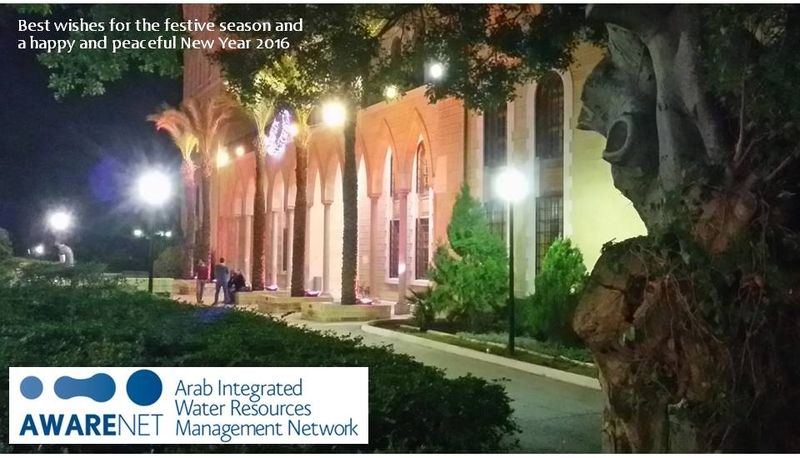 Among the upcoming activities we are currently planning for a 3rd regional training course on Water Integrity for MENA Region in early February 2016 and a 1st regional Training Course on Water, Adaptation to Climate Change, Vulnerability Assessments in middle of March 2016 (title and dates are still tentative). We will keep you informed about these plans as soon as the details are available. From AWARENET I would like to send you my best wishes for a hopefully more peaceful year 2016.